MJM Artists, kick a dope verse, CCCT​​ | Vinyl 41 - Platten uvm. Für Tapes #37 steht ein Länderkampf zwischen Großbritannien und Russland ins Haus. 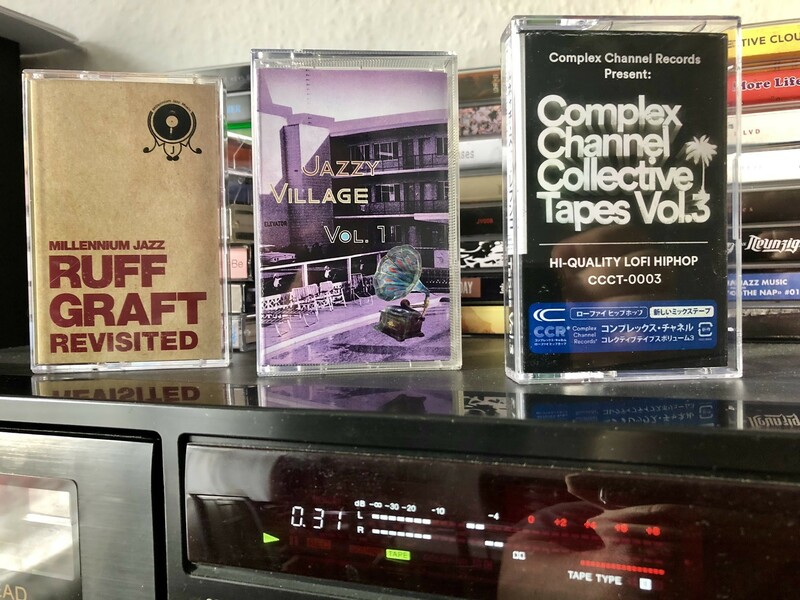 UK hat mit The MJM Artists – Ruff Graft Revisited (Millennium Jazz Music) und Complex Channel Collective Tapes Vol​​.​​3 (Complex Channel Records) gleich zwei Compilations am Start. kick a dope verse! – jazzy village vol. 1 vertritt dagegen als Einzelkämpfer die russischen Beatschmiede. Mal schauen, ob das gut geht. Viel Spass beim reinhören! „Ruff Graft was originally an in-house collaborative beat-tape made within a week by just some of the Millennium Jazz Music roster as they all took time out to pay homage to the late great Mr James Dewitt Yancey aka J Dilla. „our first cassette release, consisting of 21 jazzy beats. beatmakers from all over the world took part in it, including 8 beatmakers from russia. jazzy samples will allow you to relax and move when made a classic sound. dive into this atmosphere and enjoy it! Habe ich schon erwähnt, dass ich diese Compilation Tapes voll mag? Nein? Ich mag die voll! Alle drei Kassetten sind wieder prall gefüllt mit coolen Produzenten, voll mit feinsten instrumentalen Hip Hop Tracks und haben so richtig überzeugt. Als ganz knappen Sieger küre ich den ältesten der drei Sampler. Das oberste Treppchen für Tapes #37 geht an die J Dilla Homage The MJM Artists – Ruff Graft Revisited. Ich freue mich schon riesig auf das Vinyl, dass über QRATES gecrowdfunded wurde. Aber auch kick a dope verse! – jazzy village vol. 1 und Complex Channel Collective Tapes Vol​​.​​3 sind absolut empfehlenswert.